I just can’t seem to help myself. No sooner do I find out that I’d previously (and unknowingly) fractured a number of my ribs over a period of years, do I go and fracture my right humerus in the early evening sun of a peaceful July night. It was, of course, shortly accompanied by the familiar wash of painkillers that helped numb the pain somewhat. I’ve mentioned the humerus fracture a number of times in recent blog entries but I have not, until now, managed to obtain copies of the X-rays to highlight the break itself, and the subsequent surgical procedure that I underwent to fixate it. With thanks to modern technology, I present to you below my right humerus in post-accident pre-surgery and post-accident post-surgery poses, if you will. As White and Folkens (2005: 312) highlight fractures normally occur ‘as a result of abnormal forces of tension, compression, torsion, bending, or shear applied to the bone’, and they are often described by the features of the break itself (i.e. transverse, oblique, spiral etc). I have long feared fracturing any of my bones in either upper arms (brachium), forearms (antebrachium) or hands (manus), even though I’ve had a somewhat turbulent history of pathologically fractured bones in my lower limbs. Alongside this I have also undergone a fairly extensive list of elective surgery to fixate the femora and right tibia due to the effects of McCune Albright Syndrome (including improving the angle of the so-called shepherd’s crook deformity of the femoral neck). Thus where a natural fracture or planned surgical procedure on the lower limbs may mean I cannot use my crutches for a few months, I can still use the wheelchair to maintain physical independence. This is not so with a fractured upper limb, where healing will take many months. To return to the common name usage, I rely on my arms not just for holding or grasping objects but for the locomotion of my manual wheelchair. As such they are my legs for daily mobility. I use them also to partially bear my weight when I use my crutches to walk, so a fractured upper limb bone would mean walking is out of the question as well. I have fractured a humerus only once before, aged 13 at school. An ill-advised arm wrestle resulted in my friend looking at my pale and quickly draining face in horror as I cradled my snapped right humerus in shock. It is safe to say that my friend won that match, and I’ve been wary of competing in arm wrestles ever since! The result of that match was a lengthy spell in plaster (or some variation thereof as, after few months, plaster gave way to support splint, and splint gave way to a laughable plastic guard). X-ray of my brachium (upper arm) with the transverse (possibly oblique) fracture of the right distal humerus in a cast before surgery (far left), the post-surgery fixation with a titanium plate and screws (centre), and finally a view of the brachium that highlights the plate and the depth of the screws (right), which help to keep the fixation and fracture site stable by equally distributing stress. The tell-tale signs of the ‘ground glass’ appearance of polyostotic fibrous dysplasia (as a part of the McCune Albright Syndrome that I have) can also be seen in the X-rays, as can the evidence of a previous fracture and natural bowed shape of the humerus. In truth the recent humeral fracture was the result of my impatience, gained as a result of quickly bouncing off a curb to catch a waiting taxi, and coming off worse for wear as the wheelchair tipped and I instinctively shot out my right arm to stop myself. The pain from a fracture comes not from the bone breaking but from the damage to the soft tissues that surround the bone. The periosteum, a tough connective tissue that nourishes and covers all outer external surfaces of the bones barring articular surfaces of the long bones, is home to nerves that the bones themselves are not (White & Folkens 2005: 42). A fracture of the bone often damages the periosteum tissues (which causes pain) and leads to swelling of local tissues. The periosteum, and associated endosteum membrane (located on the inner surface of bones), are also one of the origins where the precursor bone cells develop into chondroblasts and osteoblasts, which are essential for helping the bone fracture heal successfully (White & Folkens 2005: 43). A small but significant benefit of having polyostotic Fibrous Dysplasia is the fact that the pathological fracture patterns tend to be transverse breaks due to the weak structure of the bone architecture, which tends to limit injury to both the nerves and the soft tissues surrounding the fracture area (Marsland & Kapoor 2008: 121). However, due to the pathological bone porosity and the often high bone cell turnover rate as a part of the overall syndrome, there is the prospect of extensive bleeding during surgical procedures. This can lead to extensive blood loss during major operations (such as during osteotomy procedures and/or internal and external fixations to help improve the bowing of a limb or to correct pathological fractures). As such the patient’s blood is often cross matched beforehand with suitable blood groups, for infusion during major surgical procedures to combat excessive blood loss. In the immediate aftermath of the fracture I was given heavy painkillers and taken to hospital where, after a light sleep overnight, my arm was put into a cast before I underwent surgery later in the week in a hospital nearer my hometown. The decision was taken not to reduce the bone before the surgery and just to rest it. On weight bearing bones (such as the tibia or femur) or load bearing bones (such as the mandible in adults), it is important that the bone is reduced quickly and properly to minimise complications and induce good healing (Marsland & Kapoor 2008: 120). 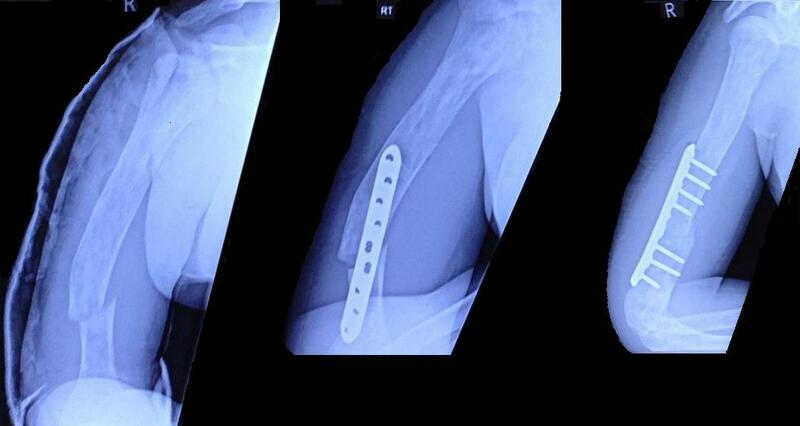 The humeral fracture was openly reduced and fixated under general anesthetic with a titanium locking plate, as can be seen in the above X-ray, and the surgeon achieved a good fix and stability of the distal humerus with the plate. Curiously, even though the fracture was trauma induced, it was less painful than the fracture that had occurred when I was 13. The arm still feels heavy and slightly cumbersome, but there is no doubt that the internal fixation is preferable to the months in the plaster cast. It will still take many months for the bone to heal properly as it is still in the early stages of the primary bony callus, a process where woven bone bridges the initial fibrous connective tissue callus that responds to a fracture in the first few days. This woven bone is, after a few months, later converted to lamellar bone and the fracture site will be further remodelled. Eventually, if a fracture site is initially kept stable by immobilization or by fixation as in my case, the bone can remodel so completely as to eliminate any trace of the original fracture (White & Folkens 2005: 48). Traumatic fractures are found in all periods of human and hominin history, and it is likely that you yourself have suffered a fractured bone of some description, perhaps even unknowingly (Marsland & Kapoor 2008: 121). They can be devastating, requiring many years of surgery or physiotherapy to gain and improve movement as the sociologist Ann Oakley highlights in her 2007 book Fracture: Adventures of Broken Body, a personal account detailing the social and professional impact of a fractured right humerus accident which had impinged on nerves, leading to reduced function and feeling. Fracture treatment has been practiced for thousands of years and it has long been known that, with the reduction of the break and stabilization of the limb, good results can be achieved (Marsland & Kapoor 2008). 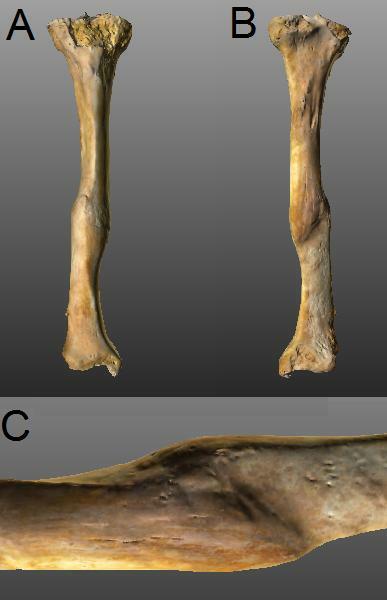 The study of fractures in populations can also highlight trends in the attention received as Meyers (2012) has highlighted in an entry on the differences of fracture treatment between Iron Age and Romano-British populations in Britain. The right tibia of an adult, courtesy of the free online resource Digitised Diseases. Notice the well healed mid-shaft oblique fracture in the (a) anterior view, (b) is the posterior view and (c) is the close up posterior view, where right is proximal and left distal. The callus is fully remodelled with smooth bone over the fracture site, where the end is displaced laterally and proximally. Image credit: Digitised Diseases 2014 (Master Record Number 0365). Still this entry’s approach is focused on the personal, not at the population level. Another part of my body has broken and it is once again held together by titanium, likely to be a permanent addition to my skeleton. The movement at the glenohumeral joint (otherwise known as the shoulder) is normal while movement at the elbow joint (comprised of the humeroulnar, humeroradial and superior radioulnar joints) is almost back to normal. There is still a lack of full extension of the joint, with noticed tension in the biceps brachii muscle as it acts as the antagonist to the triceps brachii muscle during forearm extension, although daily physiotherapy should help to regain full movement. I am no stranger to the strength of the metal in my body and I remain impressed by its capability in the use of orthopaedic fixation. The use of metallic implants to fixate fractures is nothing new as Lane (1895) and Uhthoff et al. (2006) attest. Whilst the use of casts to set fractures continues, it is the increase in the use and versatility of technology and materials to give nature a helping hand that remains the next big step in treating bone fractures (Bali et al. 2013). Metal plates have been in use for over a hundred years where early pioneers such as Lane (1895), Lambotte (1909) and Sherman (1912) first introduced plates to help stabilize fracture sites and help mobilize patients faster than plaster casts could allow (Uhthoff et al. 2006: 118). Although these early plates suffered from corrosion problems it soon became apparent that internal plate fixation could provide a safe and efficient way for patients to heal, whilst also regaining some form of movement. Various plate designs improved on earlier designs, allowing for micromotion at the fracture site and compensation for bone resorption during the healing process. Uhthoff et al. (2006: 124) contend that there are still problems in the form of internal plates, where compression and stress shielding can still lead to bone necrosis and cortical porosis. In their conclusion they argue that there still needs to be a fine balance attained between a plate design that managed to reduce stress shielding and allows adequate micromotion at the site of a fracture, both which they concur would help mimic biological healing. There also drawbacks that can include plate palpability, risk of infection, temperature sensitivity and possible growth restriction with metallic implants (Bali et al. 2013: 167). Ultimately however the body still has to heal the fracture itself over a matter of weeks and months (White & Folkens 2005: 48). “… in the arm very considerable alterations may occasionally develop, and are more marked and depreciating to the value of the individual as a machine in proportion as changes have already taken place in the particular joint or joints from the prolonged pursuit of a laborious occupation.” (Lane 1895: 861). “One cannot but feel that the perpetuation of methods of treatment which have been in use up to the present time must depend on the fact that surgeons have not taken such trouble to inquire into the subsequent life-history of these patients as they have done in other departments of surgery.” (Lane 1895: 863). There have been some distinct advances in using biodegradable plates in non-weight bearing locations, such as in the maxillofacial region, a position where many would like to avoid the intrusive nature of a temporary or permanent metal plate. A study by Bali et al. (2013: 167) has highlighted the value of using biodegradable material to help fixate trauma-induced facial fractures, reporting that each individual in the small study cohort (N=10) of varying ages, reported good reduction of fracture and evidence for the total biodegradation of the plate after two years. They also reported that no further surgical procedures were needed on their test cohort, a significant finding as metallic implants often either need removing if they are temporary or debriding if they become infected, both quite serious surgical procedures (Bali et al. 2013: 170). Unfortunately the study highlights that biodegradable implants are unlikely to be currently safe to use in weight-bearing or load bearing bones. Bali et al. (2013:171) conclude by stating that further studies are needed but biodegradable plates and screws can provide satisfactory, if expensive, stabilization as internal fixations for mid-face fractures. Medical science and engineering has certainly come a long way since Lane first introduced the internal fixation plate, yet humans are as prone as ever to fracturing their bones. As a person with McCune Albright Syndrome I may know the pain of breaking a bone, but I can be thankful that I live at a time and in a place where fractures can be confidently treated. I’ve written in more detail on polyostotic Fibrous Dysplasia and McCune Albright Syndrome here, which details the way in the which the disease has affected my skeleton. Also, on that particular post, are a host of medical, palaeopathology and osteology related articles to do with McCune Albright Syndrome and Fibrous Dysplasia in general. Alternatively search the blog for the keywords and numerous posts in which I’ve highlighted the syndrome and the bone disease will appear. A previous post on 3D printing in orthopaedic surgery can be found here, and an entry giving a quick overview of some of the problems and approaches used in studying physical impairment and disability in archaeological contexts can be found here. Bali, R. K., Sharma, P., Jindal, S. & Gaba, S. 2013. To Evaluate the Efficacy of Biodegradable Plating System for Fixation of Maxillofacial Fractures: A Prospective Study. National Journal of Maxillofacial Surgery. 4 (2): 167-172. (Open Access). Digitised Diseases. 2014. Master Record Number 0365. Accessed 18/08/14. http://www.digitiseddiseases.org/viewer/viewer_overlay.php?MRN=0365#. Lane, W. A. 1895. Some Remarks on the Treatment of Fractures. British Medical Journal. 1 (1790): 861–863. (Open Access). Marsland, D. & Kapoor, S. 2008. Rheumatology and Orthopaedics: Crash Course 2nd Edition. London: Mosby Elsevier. Meyers, K. 2012. Break a Leg! Fracture Treatment in Iron Age and Roman Britain. Bones Don’t Lie. Accessed 11th August 2014. (Open Access). Oakley, A. 2007. Fracture: Adventures Of A Broken Body. Bristol: Policy Press. Uhthoff, H. K., Poitras, P. & Backmann, D. S. 2006. Internal Plate Fixation of Fractures: Short History and Recent Developments. Journal of Orthopaedic Science. 11 (2): 118-126. (Open Access). White, T. D. & Folkens, P. 2005. The Human Bone Manual. London: Elsevier Academic Press.